Need to relax? Need to de-stress? ‘It's All Good' here at this semi-oceanfront Outer Banks property with partial ocean views, a private pool and hot tub, and more! Centrally located in Kill Devil Hills, and the beach access is just a few properties away. The three king master suites make sure everyone is comfortable. Enjoy amazing views from the top-level deck, and the mid-level deck also offers a great place to relax and watch the ocean. The pool is in a fenced back yard with poolside gazebo that is enough for family meals. The rec room offers a foosball table and LCD TV for catching the game, or your favorite shows. The full-sized fridge and half bath in the rec room area are also convenient for those using the pool deck. Top-Level: Great Room with LCD TV, DVD, Deck Access with Ocean Views, Kitchen with Bar seats 6, Dining seats 8, Hall Bathroom, King Master with LCD TV, Rear Deck off Hallway. Mid-Level: King Master with LCD TV; King Master with LCD TV; Master with 2 Double Beds, LCD TV; Laundry with Washer/Dryer, Mid-Level Covered Deck has Ocean Views, West Mid-Level Deck over looks Pool. Ground-Level: Rec Room with LCD TV, DVD, Foosball Table, Queen Sleeper Sofa, Full-size Refrigerator, Wet Bar, Half Bathroom, Direct Access to Pool Deck, Keyless Entry into Garage. Extras: Private Pool (10 x 22), Hot Tub (6), Wireless Internet Access, DVD players, Foosball Table, 2 Full-size Refrigerators, Gas Grill, No Smoking, PET NOT ALLOWED, Parking: 4, Milepost 6, Distance to the Beach: 200 ft. Need to relax? Need to de-stress? 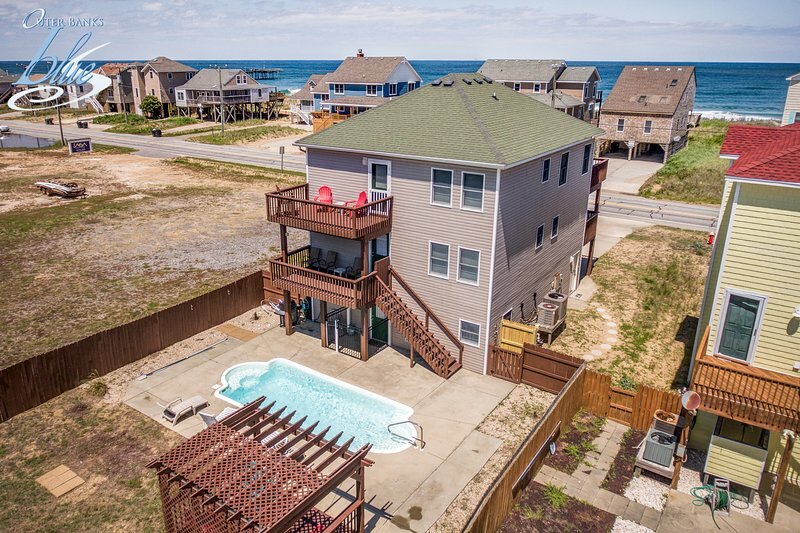 ‘It's All Good' here at this semi-oceanfront Outer Banks property with partial ocean views, a private pool and hot tub, and more! Centrally located in Kill Devil Hills, and the beach access is just a few properties away. The three king master suites make sure everyone is comfortable. Enjoy amazing views from the top-level deck, and the mid-level deck also offers a great place to relax and watch the ocean. The pool is in a fenced back yard with poolside gazebo that is enough for family meals. The rec room offers a foosball table and LCD TV for catching the game, or your favorite shows. The full-sized fridge and half bath in the rec room area are also convenient for those using the pool deck. Top-Level: Great Room with LCD TV, DVD, Deck Access with Ocean Views, Kitchen with Bar seats 6, Dining seats 8, Hall Bathroom, King Master with LCD TV, Rear Deck off Hallway. Mid-Level: King Master with LCD TV; King Master with LCD TV; Master with 2 Double Beds, LCD TV; Laundry with Washer/Dryer, Mid-Level Covered Deck has Ocean Views, West Mid-Level Deck over looks Pool. Ground-Level: Rec Room with LCD TV, DVD, Foosball Table, Queen Sleeper Sofa, Full-size Refrigerator, Wet Bar, Half Bathroom, Direct Access to Pool Deck, Keyless Entry into Garage. Extras: Private Pool (10 x 22), Hot Tub (6), Wireless Internet Access, DVD players, Foosball Table, 2 Full-size Refrigerators, Gas Grill, No Smoking, PET NOT ALLOWED, Parking: 4, Milepost 6, Distance to the Beach: 200 ft. Additional amenity details: Private pools are open from May 3, 2019 until October 13, 2019. This property is not equipped for pool heat. Pool heat is not an option for this property. Hot tubs are available from March through December. All Outer Banks Blue properties provide bed linens, bath towels, beds made prior to your arrival, and a starter supply of: toilet paper, bathroom soap, paper towels, and dishwater detergent. Discounted H2OBX Water Park tickets available when you book with Outer Banks Blue.